Artists don't often tear apart one exhibition in order to make another. But at Somerset House in October Chosil Kil (b.Seoul, 1975) will literally destroy the gallery's current Skin & Bones 'Fashion/Architecture' retrospective to immediately reassemble it as 'Cocoon'; a new womb-like construction with a new function and use. Chosil Kil's ongoing âCocoons' project explores the artist's own experiences of displacement and assimilation as a Korean moving to and living in London. Each new Cocoon or 'shelter' revisits the journey from solitary arrival to a new environment; building relationships, acquiring resources and creating a nest crucial to developing a sense of home. In each location Kil asks the local community to donate objects due to be thrown away. She then works with the donated elements - doors, windows, chairs, tables, fences and gates - taking them apart and robbing them of their original function before re-assembling them to make a new physical object. Each Cocoon is unique in its construction - a manifestation of personal experiences in each chosen destination, created and developed through meeting, getting to know the community and sometimes collaborating with local craftsman. Whilst previous Cocoons have been built within alien environments, the new work at Somerset House, will be constructed onsite within another already existing exhibition as Kil takes apart Somerset House's 'Skin & Bones' in order to reassemble part of it as a London shelter. At Riflemaker in September, Kil will show a series of 'DRAWERINGS'. 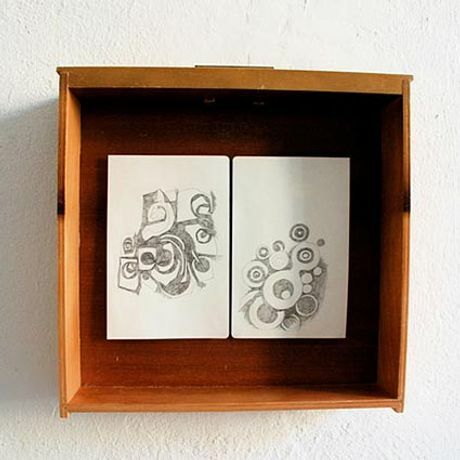 Wall-mounted drawers detached from their cabinets and desks act as frames and boxes for a series of apparently unrelated objects again placed in a new context separate to their original function. As in her previous exhibition 'Living With Andis' at Riflemaker London and Cornerhouse in Manchester, 'Drawerings' is about changing the contexts and physical forms of ordinary objects. Disassociating them from the narrative within which they usually exist, Kil uses them to tell her own unique stories, giving the objects a new poetic significance. Both âDrawerings' and âCocoon No:4' are looking at the forgotten values of physical human relationships and identifying with the universal need to find a place within society. Use of left-over wooden pieces is symbolic of both the value of tradition, of traditional communities, and of traditional materials - simultaneously affirming the value of recycling and co-operation in modern societies, and the a critique of the relentless drive to modernity that alienates citizens from each other.